Availability of Honda LaneWatch is a plus point. Handling and braking mechanisms are reliable. Low ground clearance is a disadvantage. There is scope for adding more comfort aspects. Fuel economy can be made better. The Honda Accord exudes brilliance in every department, be it the designing or the super-awesome features. It is probably the best car in its segment and is luxurious like no other. The company has also brought the 2018 version of the car in the GCC and UAE in March. The mid-size sedan is offered in two engine trims. The smaller 1.5-litre engine makes 192 PS of power and 260 Nm of torque while the other 2.0-litre unit makes 252 PS power and 370 Nm of torque. The power is sent down to the wheels via a CVT and a 10-speed automatic gearbox respectively. Have a question on Accord? Accord is available in 1 different colors - Red. Watch latest video reviews of Honda Accord to know about its interiors, exteriors, performance, mileage and more. Honda Accord is one of the most liked sedan series across many global car markets. It has a very pleasing body structure and is loaded with numerous aspects for the convenience of its occupants. It features an intelligent multi information display with an 8-inch touchscreen display. It includes large icons in simple arrangement for easy control. An interesting aspect is the HDD navigation system with Arabic text support that provides quick loading as well as clear visuals. Other features like a rear view camera, ECON button, the Honda LaneWatch and a few others are also available. In terms of interiors, it includes well cushioned seats and offers enough leg room to its passengers. The high quality materials, chrome inserts as well as front and rear LED lighting further gives it a classy appeal. The company has also packed it with some utility aspects for added convenience. Some of these include a glove box, cup holders and door trim pockets to name a few. It is blessed with an electric power assisted steering system that helps in easy maneuvering. As far as safety is concerned, it has vehicle stability assist, seat belts for all occupants and a six airbag system, which ensures maximum protection. This sedan is bestowed with a proficient suspension system that helps in giving a comfortable driving experience. This vehicle has a dynamic appearance, which can easily attract the car enthusiasts. It has an aggressive front fascia that features LED daytime running lights, large radiator grille that is garnished with chrome and sporty headlamps. The side profile comes equipped with an elegant set of alloy wheels as well as outside mirrors, while the rear end includes an expressive boot lid and a large windscreen. In terms of technical specifications, it has a 2.4-litre I-VTEC engine can produce a maximum power of 185hp along with a peak torque output of 25 Kg.m. Whereas the other power plant is skillfully mated with a 6-speed automatic transmission gear box, which performs exceptionally well. Its interiors are done up elegantly in a two tone color scheme, which is rather alluring. The roomy cabin is loaded with a number of features, which not only adds to its style but turns out useful while on journey. There is a stylish steering wheel integrated to its dashboard, which also houses an instrument panel as well as air vents. It also includes a glove box and a center console that is further fitted with a music system. The usage of high grade materials and chrome garnishing on various aspects further adds to its stylishness. The bright 8-inch intelligent multi information display provides clear access to several functions. It has a comfortable seating arrangement wherein, the driver's seat has eight way power adjustment facility along with lumbar support. The cabin also includes LED foot well lights, floor mats, cup holders, room lamps and a few other such features. 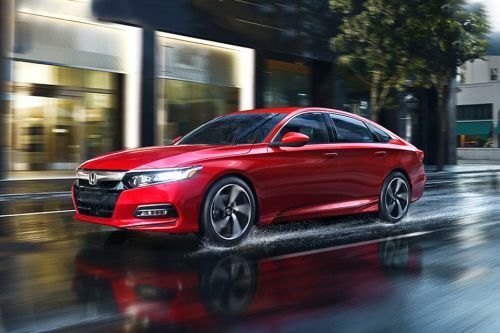 The car maker has blessed this Honda Accord sedan model series with an array of interesting features that gives a hassle free driving experience. The rear windscreen and windows have sunshades that offer extra protection besides keeping the occupants comfortable. The Honda LaneWatch is an advanced feature, which makes use of the camera mounted on the passenger mirror to provide a better view of the roadway. The proficient air conditioning unit allows to set the temperature accordingly. It has a leather wrapped steering wheel, which is mounted with audio controls. In addition to these, it has the ECON switch, auto dimming rear view mirror, smart entry system, music system, tilted sunroof, power operated windows, paddle shifters and many others that enhances the level of comfort. This sedan is offered with a seating capacity of five people. There is ample leg room available for its occupants along with sufficient shoulder as well as head space. The centrally mounted fuel tank is quite large and carries around 65 litres of fuel in it. Moreover, it has the trunk capacity of 447 litres, which can be further enhanced by folding the rear seat. For in-car entertainment, it has an advanced music system with a CD, MP3 player along with the FM radio tuner. It supports USB port, auxiliary input options and has Bluetooth hands free telephone system. It features the HDD navigation system with Arabic text support that offer clear visuals. This comes with a large 8-inch touchscreen display that provides convenient control of audio, phone and many other functions. This Honda Accord sedan series is blessed with a captivating external appearance, which makes it stand out among the others. To begin with the front facade, there is a large radiator grille with horizontally positioned slats. These are treated with a lot of chrome and an insignia of the company is engraved in its center. The well designed headlight cluster surrounds this grille and includes LED headlights as well as daylight running lights. There is a body colored bumper, which is equipped with a couple of fog lamps and an air dam. The windshield is fitted with a couple of wipers, while the bonnet looks stylish with some expressive lines over it. The remarkable aspects in its rear end include a spoiler and a large windshield. The bumper is well sculpted, while the company's badge is neatly embossed on the boot lid that has a chrome strip. Besides these, it features a radiant tail light cluster and a pair of reflectors to give it a complete look. On the other hand, its side profile is designed with external mirrors that have side turn signals, chrome garnished door handles and a classy set of alloy wheels, which are integrated to its pronounced wheel arches. This vehicle is built with a total length of 4890mm along with a decent width and height of 1850mm and 1465mm respectively. It has a large wheelbase of 2775mm, which is quite good and indicates to ample leg room inside the cabin. The base level variant is equipped with a set of 16 inch alloy wheels, while the mid and top end trims are fitted with a set of 17 and 18 inch aluminum wheels respectively. These rims are further covered with tubeless radial tyres that offer a strong grip on roads. The 2356cc mill can deliver a maximum mileage of around 12.8 Kmpl, while the 3.5-litre power plant is capable of returning a fuel economy of 11.3 Kmpl approximately. It is incorporated with a 3.5 litre petrol power plant that carries six cylinders and has the displacement capacity of 3471cc. It can belt out a peak power of 274hp at 6200rpm besides yielding a peak torque output of 34.5 Kg.m at 4900rpm, which is rather good. Meanwhile, it has a 2.4 litre I-VTEC power plant that has the ability to displace 2356cc. It is incorporated with a CVT (continuously variable transmission) gear box that assists in easier gear shifts,while offering an impressive torque. The maximum power produced by the 3.5-litre engine is 274hp at 6200rpm, while its torque output comes to 34.5 Kg.m at 4900rpm. Whereas the other motor is capable of generating 185hp at 6400rpm and yields a peak torque of 25.0 Kg.m at 3900rpm. The variants coupled with a 6-speed automatic transmission gear box are capable of breaking the speed limit of 100 Kmph in around 7.1 seconds. Meanwhile, the CVT gear box equipped trims requires nearly 9.8 seconds to accelerate from 0 to 100 Kmph from a standstill. The top speed attained by both the versions comes to around 208 Kmph. The braking system of this Honda Accord sedan series is quite reliable. There are ventilated disc brakes fitted to its front, while solid disc brakes are used for the rear ones. It has a proficient suspension system wherein, its front axle gets a MacPherson strut and there is an independent multi link assembled on the rear one. This vehicle is bestowed with an electric power assisted steering system that is quite responsive. In order to ensure the protection of its passengers, the automaker has incorporated this sedan with various security aspects. It includes driver and passenger airbags along with curtain airbags, anti lock braking system, hill start assist and vehicle stability assist as well. Other features like parking sensors, engine immobilizer, anti-slip regulator, emergency braking assist, electronic brake force distribution and some other such features for added security. I love the ride of the car, it is absolutely smooth and noiseless. What is the price of Honda Accord? On road prices of Honda Accord in starts from AED94,900 for base variant 1.5L LX Turbo, while the top spec variant 2.0L Turbo Sport costs at AED140,000 . What are the colors options available in Honda Accord?